Welcome to the Canyonlands National Park Information Guide. The closest major airport is Salt Lake City International Airport is 304 miles North of the park. 1. Head to I-70 East to Highway 191 South towards Moab. Just before Moab, take Stateroad 313 Southwest to the Park. This will take you to the north entrance and visitors center in the Island of the Sky District. 2. Head to I-70 West to Highway 191 South towards Moab. Just before Moab, take Stateroad 313 Southwest to the Park. This will take you to the north entrance and visitors center in the Island of the Sky District. 3. To the Needles District, take Highway 191 South, at Church Rock take Stateroad 211 West to the Park and Squaw Flat Campground. 4. To the Maze District, the Hans Flat Ranger Station is two and one-half hours from Green River, Utah. From I-70 take Stateroad 24 South for 24 miles. Make a left turn onto a dirt road that is just past the turnoff to Goblin Valley State Park. Follow this two-wheel-drive graded dirt road for 46 mi / 74 km east to the Hans Flat Ranger Station. 1. Head to I-70 West to Highway 191 South towards Moab. Just before Moab, take Stateroad 313 Southwest to the Park. This will take you to the north entrance and visitors center in the Island of the Sky District. 2. To the Needles District, take Highway 191 South, at Church Rock take Stateroad 211 West to the Park and Squaw Flat Campground. 3. To the Maze District, the Hans Flat Ranger Station is two and one-half hours from Green River, Utah. From I-70 West take Stateroad 24 South for 24 miles. Make a left turn onto a dirt road that is just past the turnoff to Goblin Valley State Park. Follow this two-wheel-drive graded dirt road for 46 mi / 74 km east to the Hans Flat Ranger Station. 3. To the Maze District, the Hans Flat Ranger Station is two and one-half hours from Green River, Utah. From I-70 East take Stateroad 24 South for 24 miles. Make a left turn onto a dirt road that is just past the turnoff to Goblin Valley State Park. Follow this two-wheel-drive graded dirt road for 46 mi / 74 km east to the Hans Flat Ranger Station. 1. To the Maze District, take Highway 191 North to Stateroad 95 West to Stateroad 24 North. Make a left turn onto a dirt road that is just before the turnoff to Goblin Valley State Park. Follow this two-wheel-drive graded dirt road for 46 mi / 74 km east to the Hans Flat Ranger Station. 2. To the Needles District, take Highway 191 North, at Church Rock take Stateroad 211 West to the Park and Squaw Flat Campground. 3. To the Island in the Sky, 191 North past Moab. Just after Moab, take Stateroad 313 Southwest to the Park. This will take you to the north entrance and visitors center in the Island of the Sky District. Public awareness of the scenic canyon country likewise expanded, mostly due to the efforts of Arches National Monument Superintendent Bates Wilson. Wilson first visited the area by horse in 1951, riding to the Confluence and up Salt Creek. His early mapping of archeological sites in Salt Creek and Horse Canyon spurred the interest of University of Utah archeologists. Wilson worked from 1951 to 1955 for an official National Park Service investigation of the area. In 1957 he began leading visitors into the Canyonlands area, publicizing its scenic and recreational values, and recommending the creation of a “Grand View National Park.” Secretary of the Interior, Stewart Udall, visited the area in 1961, and began campaigning for a national park on what were then Bureau of Land Management lands. Canyonlands National Park, consisting of 257,640 acres. The park was expanded in 1971 to its present 337,570 acres, or 527 square miles. Canyonlands preserves an immense wilderness of rock at the heart of the Colorado Plateau. Water and gravity have been the prime architects of this land, cutting flat layers of sedimentary rock into hundreds of colorful canyons, mesas, buttes, fins, arches and spires. At center stage are two great canyons, those carved by the Green and Colorado rivers. Surround the rivers are vast and very different regions of the park: to the north, Island in the Sky; to the west, the Maze; and to the east, the Needles. The areas share a common primitive spirit and wild desert atmosphere. Each also offers its own special rewards. Few people were familiar with these remote lands and rivers when the park was established in 1964. Prehistoric Native Americans, cowboys, river explorers and uranium prospectors had dared to enter this rugged corner of south-eastern Utah, but few others did. To a large degree, Canyonlands remains untrammeled today. Its roads are mostly unpaved, its trails primitive, its rivers free-flowing. Throughout its 527 square miles roam desert bighorn sheep, coyotes and other animals native to this land. Canyonlands is wild America. 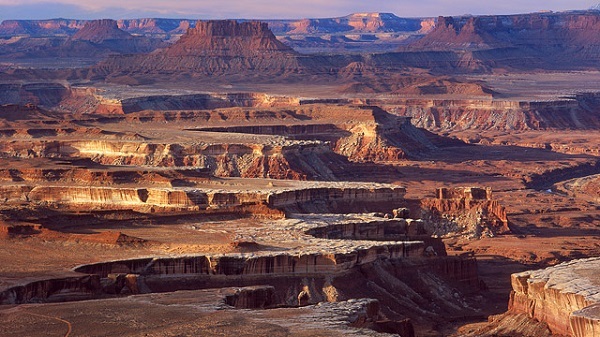 Canyonlands National Park is a showcase of geology. While this area has diverse ecosystems and is rich in history, geologic processes have played the most important part in shaping Canyonlands. The arid climate and sparse vegetation allow the exposure of large expanses of bare rock, and the great canyons of the Colorado and Green Rivers reveal 300 million years of geologic history. The word desert often conjures up the idea of a barren, desolate land void of life, with high temperatures and no water. This is not completely without foundation. In fact, the word desert originates from the Latin word “to desert, or abandon.” Deserts, however, are not lifeless; certain plants and animals have adapted to the extreme conditions. Squaw Flat Campground and restrooms are wheelchair accessible. Visitor Center and restrooms at Island in the Sky and Needles are wheelchair accessible. Canyonlands has become an increasingly popular backcountry destination. Permits are required for all overnight travel in the backcountry. During the spring and fall, demand for backpacking and four-wheel-drive permits frequently exceeds the number available. If you plan to visit Canyonlands National Park during peak season, it is recommended that you make reservations well in advance. Canyonlands is famous for its mountain biking terrain, especially for the White Rim Road in the Island in the Sky District. Mountain bikes must remain on established roads; they are not allowed on hiking trails. Many four-wheel-drive roads in the park travel up wash bottoms and are unsuitable for bikes due to deep sand. Overnight trips require backcountry permits, and bicycle parties must use designated campsites. Reservations are highly recommended for permits to camp along the 100 mile White Rim Road, as sites often fill many months in advance. A support vehicle is recommended for all multi-day bike trips. The Colorado River is famous for its rapids and the challenging Cataract Canyon is located within the park. Above the Confluence, the calm waters of both the Green and Colorado rivers attract boaters seeking a more peaceful journey. Permits are required for all overnight river trips, and for day trips through Cataract Canyon. Guided trips are also available. Camping is allowed in campgrounds and at designated backcountry sites with a fee permit. Campfires are only permitted along the river corridors in Canyonlands National Park. Charcoal or camp stoves are recommended for cooking. All fires must be contained in a fire pan, which may be as simple as a metal garbage can lid or an oil pan. The massive sandstone towers of the Island in the Sky District attract the most rock climbers. Little climbing is done in the rest of the park due to the poor quality of the rock and a lack of established routes. Permits are not required for technical rock climbing unless it involves an overnight stay in the backcountry. There are no restaurants or snack bars in Canyonlands National Park. At the Needles Outpost, 1.5 miles from the Needles Visitor Center, there is gasoline, food and limited supplies available and all services are available in the local communities. Park Headquarters is located in Moab, Utah and is open year round. Available Facilities : No water is available in the District, bring your own water! Bottled water is available for sale at the visitor center. Exhibits are on display, and maps, publications, programs and information are available. Pets are not recommended in the park. If you must or want to bring your pets with you, be aware that they must be on a leash and under control at all times, they are Not Permitted in the backcountry (even in a vehicle) or on any park trails. During spring and fall, the daytime highs average 60 F to 80 F and lows average 20 F to 50 F. Crowds are largest and campsites and backcountry permits are most difficult to obtain during holiday weekends such as Easter and spring break. Summer temperatures approach 100 F, and discourage crowds and tend to make strenuous exercise difficult. Most precipitation falls in late summer and early autumn thunderstorms. Winters are cold, with highs averaging 30 F to 50 F, and lows averaging 0 F to 20 F. Though large snowfalls are uncommon in the park, even small amounts of snow or ice can make trails and roads impassible. Many four-wheel-drive roads are closed in winter.